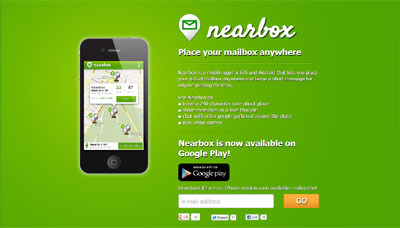 Nearbox is a mobile app that lets you place your virtual mailbox on the map and leave a short 240-character message for anyone passing there by. Explore city by finding interesting information pinned to the places on the map, play urban games with friends or promote your local business by leaving coupons inside mailboxes. Notes about places are grouped into mailboxes which can be set and open only by users who are nearby. What is more, Nearbox provides extra feature called “geonotification” that lets notify users about special offers everytime they’re passing by their favourite restaurant or pub.